PMSJ: How did you get involved with PROOF? EP: I got involved with PROOF in 2011, when I took part in The Rescuers exhibition in Phnom Penh, contributing by taking Aki Ra’s portrait. An ex-Khmer Rouge soldier, Ra is now a CNN Hero and role model in Cambodia. PMSJ: You've been working primarily in Cambodia—why did you choose that country? EP: I’m sure I’m not the first to say: “I came to Cambodia, and I fell in love with the country and its people,” but I think part of it was that I found a lot of similarities with Colombia, my country. Despite being across the world from each other, the two countries have both faced extreme violence at different times in their histories. The similarities of the past and the contrast of the present became a big question for me. I wanted to understand. I still don’t. PMSJ: What are some of the issues facing Cambodians today? 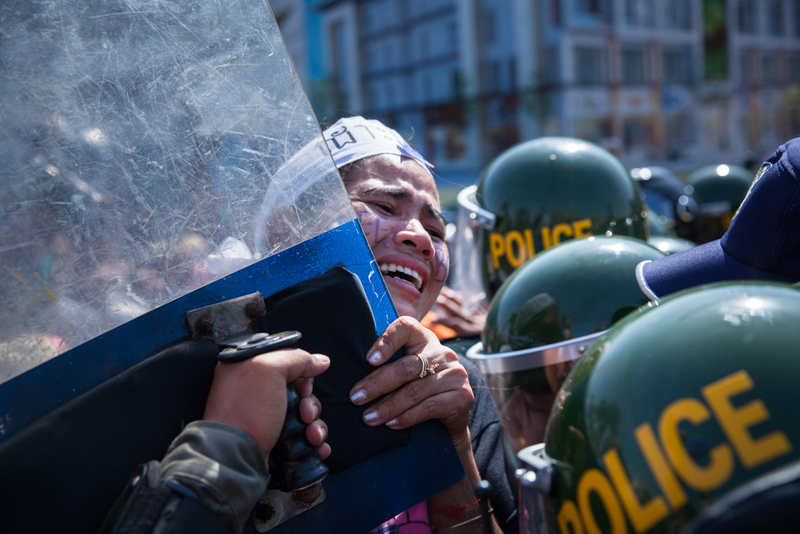 EP: Besides dealing with the traumatic legacy of the 1970s genocide, Cambodia continues to struggle in building a healthy democracy and stability on human rights issues. ‘Forced evictions’ are one of Cambodia's biggest challenges. This—like many of the country’s problems—can be traced back to the Khmer Rouge era, when entire cities were evacuated to the countryside to take part in an agrarian utopia, and private property was abolished along with any record of land registrations, birth certificates, etc. With Cambodia’s fast-growing economy and its emerging middle class, the demand for land for commercial, agricultural, and housing development has increased drastically. It has displaced thousands of people across the country, leaving them homeless and pushing them into poverty. However, communities are fighting back, organizing themselves to demand solutions. In response, authorities are cracking down on demonstrations and even taking court action to intimidate any form of activism. PMSJ: You have met so many people in Cambodia—what message would they want you to share with our readers? EP: This is a hard question that carries great responsibility. I’d say people need to know that suffering and injustice in Cambodia did not end with the Khmer Rouge era a few decades ago, but that it is still happening. Despite the obvious and repeated human rights abuses in the country, the Cambodian government receives huge financial support from our countries through foreign aid. Most of us don’t know this, but these people, whose most basic rights have been violated, do. I have often been asked: “Why does your government support mine, when my government does this to us?” They want answers, and they want to be heard. They know that the bleak situation of human rights in their country won’t allow them to see an end to their problems, but they are well aware of the importance of setting precedents through their struggle. Unfortunately, Cambodia does not get a lot of support for the current situation. And it is hard to heal the past, when the present is so daunting. PMSJ: What are your challenges working in Cambodia as an outsider? EP: I think the biggest challenge has to be to never quite know what really is going on. The language and cultural barriers, the value attached to not ‘losing face’ in particular, make it very hard to understand the place and what people really are going through. This is probably the main reason why I like to focus on long-term projects, which allow me to spend more time with the people, giving me a better chance to understand what lies underneath.